OpenStreetMap is a free map of the world, continuously edited and updated by numerous volunteers. The resulting data is available to others who can render the geographic data differently and provide maps in other formats. Freizeitkarte is one such service, providing maps with prominently featured data for cyclists and pedestrians, including topographical contour lines and hiking trails. They are available for download for Garmin and Android devices. To manage maps on a Garmin device you first need to install Garmin BaseCamp on your computer. You can then install the downloaded Freizeitkarte maps so that they will become available inside the application. 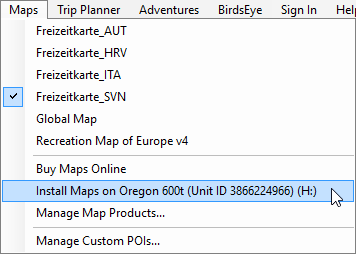 Once you connect the GPS device to your computer via USB, an option to install the maps to that device will be added to the menu. 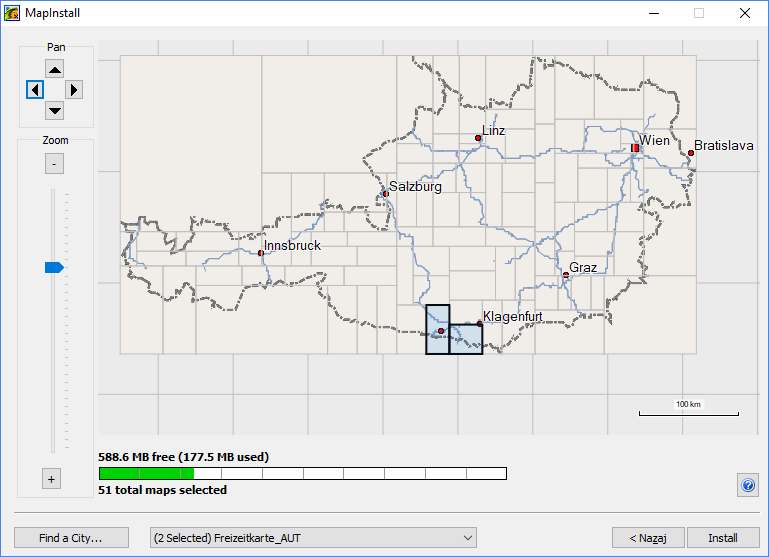 This will launch Garmin MapInstall wizard, which can be used to install or remove the maps. The preview on the right of the window will show the resulting map coverage and the available storage space on the device. You can choose the map to configure using the dropdown at the bottom. You must navigate the map using the pan and the zoom controls on the left. There's no way to do it using the mouse. Left click a map part to select it for installation and right click it to deselect it. Once you're satisfied with the configuration, you can start the installation using the Install button in the bottom right. There's a more detailed guide available at GPSFileDepot. This will display a list of maps installed on your device. You can enable or disable each one of them using the toggle on the right. To force a specific map to be used, just make sure that it is the only one enabled. And remember to reenable a map once you go somewhere else if you can only see a white screen instead of the map. Again, more detailed instructions are available at GPSFileDepot. I've been using Freizetkarte maps for several months now in Slovenia and all the neighbouring countries. They are surprisingly accurate. I haven't encountered any bogus trails and very few trails were missing. Although I haven't done so yet, I like the idea that I could update OpenStreetMap with my own data if I wanted to. If you're using a Garmin GPS device for hiking, I strongly recommend Freizeitkarte maps. I haven't tried using them on Android devices but they should work just as well.